Once there lived a bad lion in a forest. He was the king of the forest and thought that he is the superior of all the animals in the forest. He mercilessly started killing many animals and all the animals in that forest were in terror. 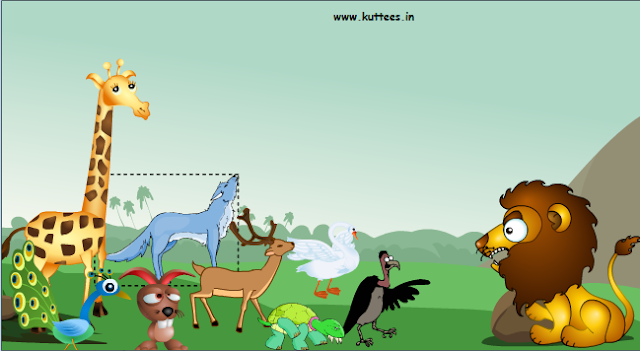 All the animals held a meeting and brought forth a plan. They all met the lion and requested him to stop the unnecessary killings of innocent animals. They told him that they would send one animal every day for his food. The lion was very happy that he could get the food without even hunting. So he agreed to their request. So the next day, all animals gathered again to decide upon whom to be sent to the lion, for that day. They all were sad and confused to select one among them. The oldest hare in the group came forward and said, "Friends I am very old and I am very happy about the life I have lived. So I will go to the lion today." All the animals felt very sorry for the hare. The hare left for the lion's den. But the hare didn't go to the lion immediately. He roamed all around the forest and reached the lion's den very late. The lion was very angry and asked the hare, why he was so late. The hare with a very sad face said, "Sir, when I was coming to your den. I saw another strong lion who held me for a long time. Even after telling him about you, he refused to send me. I somehow managed to escape from him and that is why I was so late. I am really sorry for the delay"
The lion's face turned red. He was angry about the other lion so he asked the hare to show the other lion to him. 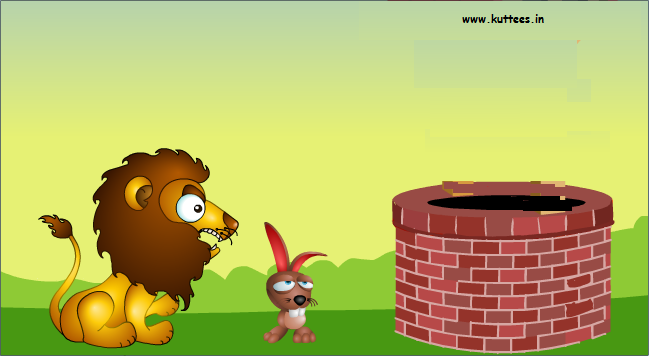 The hare led him to a nearby deep well and said the other lion was inside the well. The Lion looked into the well and roared loudly. His own image in the water also roared similarly. He stupid lion thought that was another lion. He at once jumped into the well and died. All the animals praised the hare for its smartness and they all lived happily for ever. MORAL: Wisdom is stronger than physical strength.